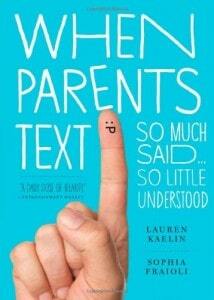 When Parents Text: So Much Said…So Little Understood is an absolute riot. Let me tell you a little story. I decided to read this book in bed, to unwind after an incredibly stressful week. For the first several pages, I was laughing out loud…and each time I would erupt into laughter, my husband would open his eyes and ask me to at least read aloud if I was going to keep waking him up. Trying to stifle my laughs, I rolled onto my side, away from him, so I could bury my face in the pillow every time I laughed. That didn’t work out so well either, as my uncontrollable laughter had the bed shaking. I literally had to put this book down because it was too funny to read in bed. That’s a first. I am in LOVE with this book. The laughs never end. Of course, I deal with a parent texting almost daily, so this is like validation for my frustration…or maybe like a support group. Whatever it is, it’s a LOL (no, not “lots of love,” Mom!) good time. I highly recommend When Parents Text; it’s a perfect book for when you need a laugh…and would definitely be a great conversation piece if left on your coffee table.